How much Captisol® is needed in an injectable formulation? In general, sufficient Captisol® will be required to achieve the target solubility of the drug as determined from the phase solubility diagram, plus a safety margin to allow for temperature changes, etc., during processing and storage. Preformulation and formulation studies should be conducted which will define the minimum amounts of complexing agent needed to assure solubility of the active (and in some cases potential degradants, etc) across the expected range of temperatures, ionic strengths, pH values, dosage strengths, etc. Representative solubility data are expressed in the figure below as a solid line. The broken lines on each side of the solubility line delineate a zone that incorporates the effects on solubility of temperature, ionic strength, etc. as well as errors in determining the solubility values. 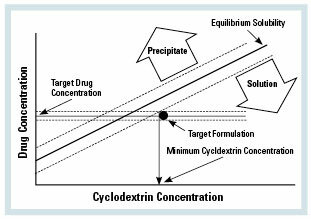 To avoid potential precipitation, the cyclodextrin concentration must be selected such that the target formulation composition will lie to the right of the zone. The desired drug concentration, along with the acceptable range encountered during manufacturing, is extrapolated to the region to the right of the solubility line. An acceptable minimum cyclodextrin concentration is then selected whereby the minimum cyclodextrin possible in manufacturing is capable of solubilizing the maximum drug possible in manufacturing. This process will give a minimum acceptable level of cyclodextrin in the formulation. Of course, higher levels of Cyclodextrin can be used if supported by appropriate safety, PK/PD, and formulation studies. What is the maximum dose that can be administered per day in nonclinical studies by intravenous routes? Each licensee of Captisol® must determine for themselves the maximum amount of Captisol® acceptable for dosing by any route of administration. The safety of dosing will involve the required therapeutic dosing durations, exposure levels, the disease state and any other factors not associated with Captisol® alone. CyDex supplies the Captisol® safety package for review and consideration in making such a determination. The licensee will support their decision based on studies of the drug substance as formulated with the full vehicle including Captisol®. The maximum dose of Captisol® that can be administered per day in nonclinical studies will depend on the species involved, the duration of dosing, the route of administration and finally any particular practices set by the institutations toxicology protocols. How much Captisol® has been administered to humans? CyDex has a compilation of information regarding levels administered in clinical studies by various routes. Data is available for discussion to help select the appropriate amounts. How much Captisol® is contained in the marketed formulations and how much Captisol® is received by patients? Vfend IV is available as a lyophilized powder which contains 200 mg voriconazole and 3200 mg Captisol® in a 30 ml vial. It is reconstituted prior to injection and administered at a max rate of 3 mg/kg over 1-2 hours. The dose is divided into a loading dose of 6 mg/kg every 12 hours for 2 doses followed by a maintenance dose of 4 mg/kg every 12 hours. Duration of IV dosing is dependent on patient status. Please see label for additional details. NOTE: The oral Vfend does not require the use of Captisol®. Geodon IM is available in single dose vials containing 20 mg/ml ziprasidone mesylate and 294 mg/ml Captisol® when reconstituted with SWFI. The dose is 10?20 mg IM up to a max dose of 40 mg/day IM. Dosing for more than 3 days has not been studied. Please see label for additional details. NOTE: The oral form of Captisol® (Captisol® in Europe) does not require the use of Captisol®. Abilify IM is available in single dose vials containing 7.5 mg/ml aripiprazole and 150 mg/ml Captisol® as a ready-made solution. The dose is 15-30mg IM. Please see label for additional details. NOTE: The oral form of Abilify does not require the use of Captisol®. Cerenia SC (veterinary application) is available in single dose vials containing 10 mg maropitant citrate and 63 mg Captisol®. It is reconstituted prior to injection and administered once a day for up to 5 days. Please see label for additional details. NOTE: The oral form of Cerenia does not require the use of Captisol®.